I often joke that when my son finishes college I will become and hairdresser but since that is quite few years away, I am currently practicing on my mom. My mom is natural and had been natural going on ten years but she has always struggled with hair that was brittle and breaking. In May after my vacation and stocking up on all things Ettenio I made it my mission to help her grow back hair where she was beginning to have bald spots. The plan I concocted was to wash her hair at a minimum of twice a month (if she would allow me). When I began telling her about the Ettenio products and that the ingredients were all natural she agreed to be my Guinea pig. After each wash cornrow her hair (she is a wig connoisseur) for the week, then apply Ettenio Scalp restore to her scalp. 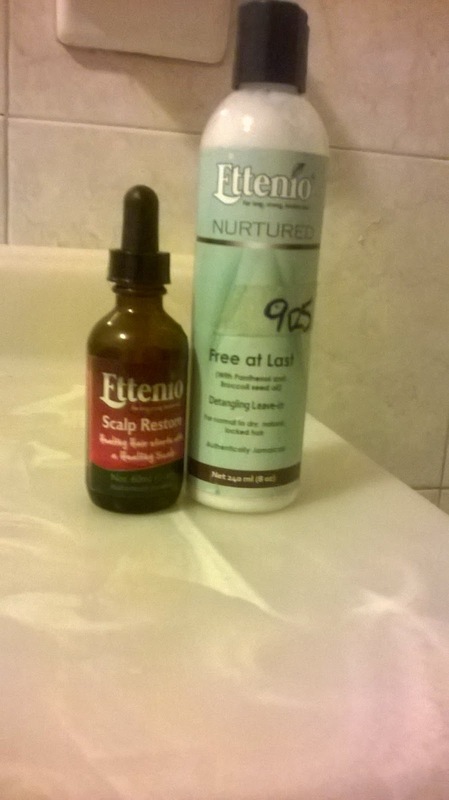 I instruct her to apply the Ettenio free at last leave-in and scalp restore to the cornrow and her scalp very other day. On the weeks when she did not wash I would take out the cornrows and apply Shea Moisture Extra Moisture Transitioning Milk and re braid. The Shea moisture was one of those buys that didn't work for me but I figured since she is natural and is not wearing her hair down it would work for her. She no longer has any bald spots and is very excited that her hair has grown back. At the beginning of her hair journey there would be hair all over the bathroom and on the comb. After a month you could not tell if she washed her hair by looking in the bathroom. I would have hair in my clothes and loads in the comb after am done braiding her hair. Now very few hair is in the comb after the detangle and braiding session and it is all shedded hair. I was a little worried that we would be unable to replenish our Ettenio stock until I came across a US distributor Irie Jamaican Treats and had the best experience ordering from her. My mom is a little worried that the winter will make her hair dry and brittle again but I promised her we will triumph. I wish she would allow me to post before and after pictures but such is life. 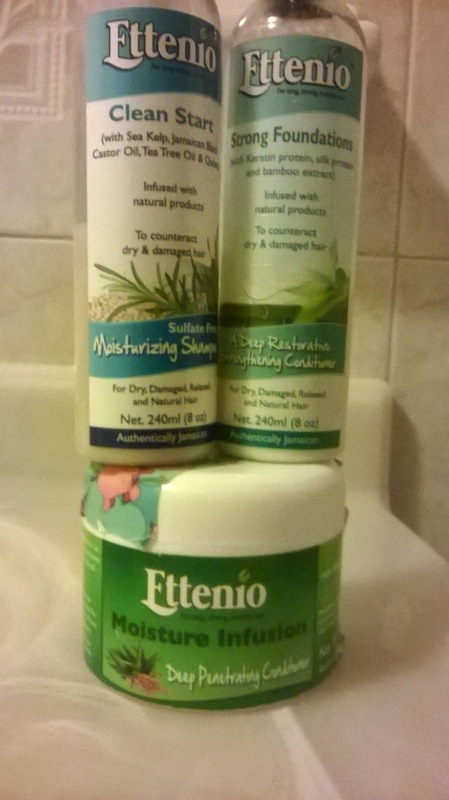 Disclaimer: I do not work or have any affiliation with Ettenio, I'm just a satisfied costumer (at least my mom is). Thanks Abbii; yeah their price is in the range of Carol's Daughter and Shea Moisture but it is total worth splurging on. I cannot wait to see before and after photos. 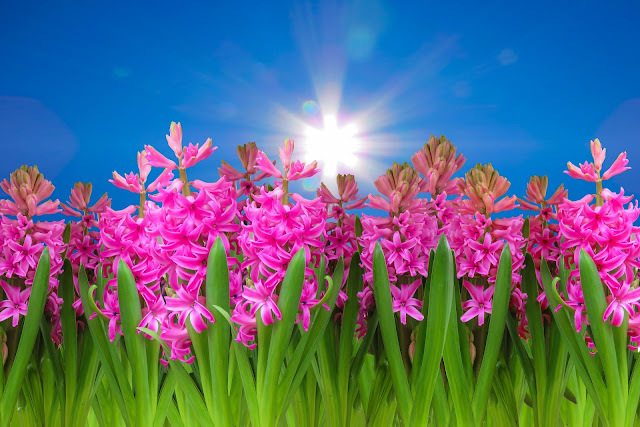 I already know that you will do a good job. Thank you, she is loving it.